A very romantic tour, perfect for pairing with a stay in New York or Boston. The perfect trip to the East Coast USA, leaving from New York as the ideal starting point for the exploration of these lands washed by the ocean. Boston will enchant you with its European spirit and as the tour goes on, the cities will become smaller, as nature is still the true king of this region. Book your road trip in the United States. Choose a self drive car tour means to take advantage of the experience and professionalism of a tour operator that specializes solely in trips to the United States. Remember that the rates do not include flights and that children under 16 do not pay for the hotel if they share the room with their parents. You can ask us for a quote for this trip without any modifications or you can contact us to personalize it any way you like, with changes to the route or the type of the car. For more information, contact us at: info@xploreamerica.com. Cottage, barche a vela, gallerie d'arte, villaggi pittoreschi, squisiti frutti di mare e oltre 600 km di coste e spiagge! Cape Cod è una buona fuga da Boston ma occhio ai prezzi..si tratta di una zona molto esclusiva! Città piccola e tranquilla ma molto pittoresca con case d'epoca, splendidi panorami sull'oceano, fari sulla spiaggia, ottima birra artigianale nei pub e squisiti frutti di mare nei ristoranti! Il kayak sui laghi, i sentieri nelle Green Mountains, i formaggi locali, lo sciroppo d'acero, le colline verdi, i ponti coperti di legno, le fattorie, i villaggi pittoreschi e, nel periodo giusto, il posto migliore per il foliage! Un riserva naturale con 42 montagne, vallate, laghi e oltre 3000 km di sentieri: benvenuto nel parco di Adirondack! Qui potrai vedere i castori e percorrere un pezzo del magnifico lungo lago attorno al Lake George. You can book a tour as it is, book just the hotels or completely personalize the itinerary any way you like. Contact us for more information and to get a personalized quote. Ritiro dell’auto e partenza in direzione nord, seguendo la costa e attraversando il Rhode Island, con destinazione Newport, importantissimo centro dello Yachting. Arrivo a Cape Cod, penisola di spiagge bianche, villaggi storici ed eccellenti aragoste. Prima parte della giornata dedicata alla scoperta della romantica Cape Cod. Da non perdere l’Old King’s Highway, una delle strade più panoramiche del New England, e l’area naturale protetta del Cape Cod National Seashore. Concedetevi un pranzo in una delle magnifiche locande e nel pomeriggio spostatevi verso Boston con arrivo nel tardo pomeriggio. Oggi lascerete la città di Boston per entrare nello stato che è il vero cuore del New England: il Maine! Il tragitto sarà breve, così che lungo il cammino possiate avere il tempo di fare delle brevi soste in località deliziose come Marblehead e Porsmouth. Kennebunkport è un antico villaggio di pescatori che oggi si è trasformato in un’elegante cittadina ricca di boutique di lusso, gallerie d’arte e ottimi ristoranti. E dopo aver ammirato le sontuose residenze di Kennebunkport continuerete il vostro viaggio attraverso il Maine in direzione nord-ovest. Le White Mountains sono uno dei parchi naturali più amati dagli americani: vantano le montagne più alte del New England e offrono panorami davvero mozzafiato. Per i più temerari consigliamo un giro sul Mount Washington Cog Railway, un treno che si inerpica fino alla vetta più alta del parco! Oggi continuerete ad essere immersi nella natura: dopo esservi lasciati alle spalle le alte vette delle White Mountains attraverserete i boscosi territori del Vermont fino ad arrivare a Lake George, località che si trova alle soglie dello splendido Adirondack Park. Questo parco è un’enorme riserva naturale che si distende intorno ai monti Adirondack e che vanta oltre 3.000 laghi e 48.000 km di fiumi! Partenza da Lake George per rientrare a New York. Lungo il tragitto potete concedervi una bagno termale a Saratoga Springs e poi riprendere la strada attraverso la bellissima zona rurale dei Catskill. Seguendo il corso dell’Hudson River, con le sue idilliache vallate punteggiate dalle residenze di campagna di famiglie come i Vanderbilt e i Roosevelt, arriverete infine nella Grande Mela. It's the one that you like? Type of hotel is purely indicative, please let us know your preferences, everything could be changed before booking. Budget style: economy and turistic accomodation, good value/price. Best solution for budget travellers. Deluxe style: superior accomodation, central locations e more spacious rooms. Let us know if you can be flexible on your departure date in order to save money. Our self drive car tours are not fixed, you can add more days or change the itinerary. Let us know your ideas. An amazing car tour in the USA, a full circle that starts and ends in the magnificent Chicago and leads you to explore parts of the legendary American Midwest. Cities and great prairies all the way to Washington, where you will breathe the history and the present of the United States. Who hasn’t dreamt of going to Mrs. Fletcher's for a cup of tea? This trip will take you to gorgeous beach towns, lighthouses rising from the ocean and endless forests. If you’re tenacious enough, you can even spot some whales, golden eagles and the wildlife that is typical of the American East Coast…such as lobsters! Start and finish in New York City – you can decide how many nights you want to stay in the city that never sleeps, but you can also leave immediately and start exploring the Great Lakes and the Niagara Falls. The landscape is pleasant, as you pass through forests and along the ocean shore, across the Amish counties and Washington D.C.
A car tour in America starting off from legendary NYC. 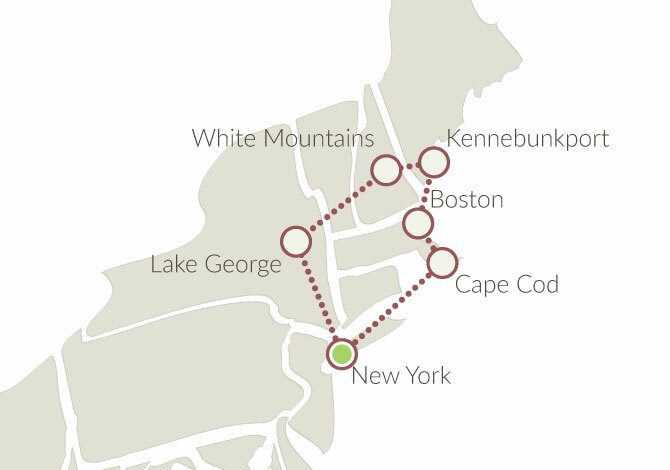 You can decide how many nights you want to spend in the city and start exploring the north all the way to Canada, passing through the amazing coast of New England. A tour dedicated to cultural differences and culinary experiences. After having explored New York City, you should move to its surroundings! Try, for example, the “Las Vegas of the East” – Atlantic City, and then continue to Philadelphia and the Amish counties. A self drive car tour in the United States to learn and appreciate the American culture as a whole, visiting places related to its constitution as well. This car tour in America is dedicated entirely to the East and it will definitely not disappoint you. The landscapes and cliffs are breathtaking in the winter as well as in the summer. You can watch the sunset tucked cosily on the patio of your hotel or try a hike or two, and then, for dinner, find yourself face to face with a giant lobster! Start and finish in New York, where you can decide exactly how many nights you want to stay. Then, head north to discover Eastern Canada. A magnificent, endless land that will show you sunsets you will never forget. Back in the USA you will also get to explore the city of Boston. and remember, the sooner you book, the less you pay! Ask for an estimate that includes a return flight and save money! For your travel to the United States, we can book flights from any european city, internal flights and transfers. Need a group quote? Contact us! Hundreds of car, bus and motorbike tours for your trip in the United States...and remember that each tour can be modified based on your needs!